Her ethereal beauty astounds me. Waterhouse perfectly captured the muted sunlight in her hair. But what moves me beyond comprehension is her expression; wonder, wistful, wanting and acceptance of her fate. Cursed, and yet more – she is enchanted. Her love for him is enough to willingly accept death. Could I ever love someone so deeply? Beside me, a man grunts as his companion murmurs quietly and I wonder if she, too, is emotionally moved by the painting. Just like a man to not appreciate an exquisite gift so freely given. I hadn’t meant to utter the words aloud but when his companion’s eyes turn to mine I see sadness, understanding and resolve. Her brows furrow and she drops her hands to her sides and walks away leaving the foolish man. He is Lancelot, ignorant he has just lost his greatest treasure. Flash Fiction – super short stories, or as I like to think of them, poems that I understand. I am totally inspired by my friend, author Rebecca Barray and her ability to capture the story in 55 words. I tried, and failed. 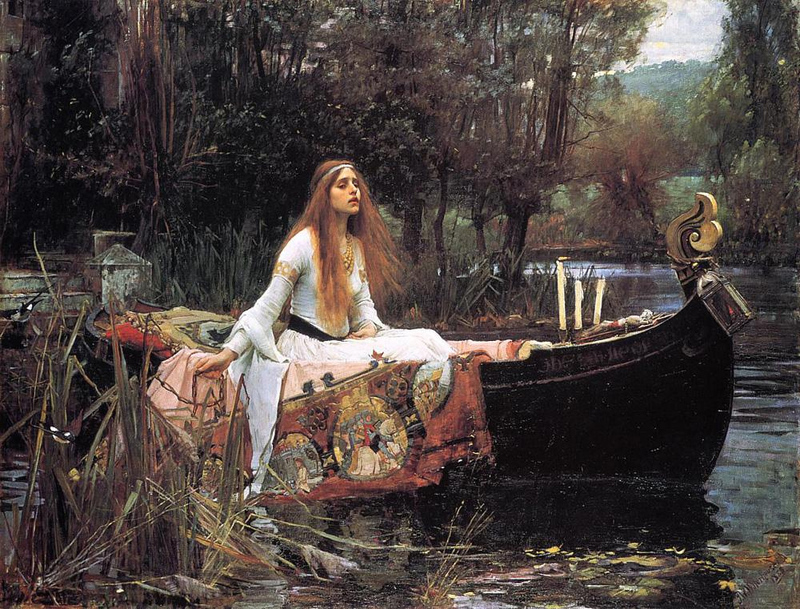 When I first saw this painting in London I was mesmorized and then went home and read Tennyson’s poem and cried for her. I wish I had her strength and I wonder if Lancelot would have been happy in love, his heart would be torn in two – but alas, that is another story to be told… You can find Tennyson’s poem here.